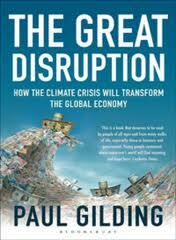 For some time now, a number of people have urged me to read The Great Disruption: How the Climate Crisis Will Transform the Global Economy, by Paul Gilding (2011). I grabbed a copy a little while ago. I was prompted to examine it more closely after reading this article by Gilding. I appreciate optimism. But this piece leaves optimism behind in preference to incredible confirmation bias. I’m simply advocating a careful rational discussion about the opportunities open to us, and an intelligent debate about the alternatives, in the context that a failure to change will have consequences. I don’t see how nuclear can even be a good partial solution given the complications of waste, terrorism and supply limits. I’m certainly open to being persuaded why I might be wrong, but I haven’t been yet. I’m going to resist the temptation to go after the obvious points of waste, terrorism and supply limits. Instead I want to look at the packaging. Firstly “I don’t see how nuclear can even be a good partial solution”. Gilding has missed the fact that it is already well more than a partial solution. Thanks to the existing deployment of nuclear power, over 400 reactors in around 30 nations, this technology avoids emissions of around 2 billion tCO2-e every year. If that is not the starting point of considerations, then the ensuing discussion is going to be anything but careful and rational. Secondly, “I’m certainly open to being persuaded why I might be wrong, but I haven’t been yet”. This irks me. The message seems to be that the world owes Gilding an argument in favour of nuclear, made to Gilding’s satisfaction. It doesn’t. I used to be ardently anti-nuclear. I changed my mind over a period of years, firstly just quietly thinking and paying attention, then actively researching and exploring the issues. Many people were influential. No one persuaded me why I was wrong. I did that bit. It’s called analysis. Gilding then asserts that “geothermal and renewable energy provide an intrinsically more elegant and intelligent solution to our energy needs than anything else”. If anything in this space could be described as “intrinsically intelligent”, it would be the fastest possible replacement of fossil plants with zero-carbon alternatives that deliver the exact same service. That’s what France did, and the technology deployed was nuclear power. Again, as recently argued, trying to deploy technologies that act nothing like what they are supposed to replace is part of what has driven our failure so far. So there is just so much energy available, it is implausible that we cannot access it effectively and at a reasonable price if we put our minds to the task. Consider the alternate burdens of proof. In the case of nuclear power, a case must be hand-delivered covering a range of issues to the author’s satisfaction, despite the fact that it is already doing precisely what is needed (with some acknowledged drawbacks). In the case of renewable technologies, the mere presence of an abundant raw resource makes anything other than success “implausible” provided we try hard enough. What happened to “careful rational discussion” and “intelligent debate about the alternatives”? This is self-serving reasoning for a vision that arbitrarily excludes nuclear. This point becomes apparent when Gilding assures us that “something else will come into play that will kill off nuclear power and coal with CCS. That is the speed of change”. Within a few pages “careful rational discussion” has become “kill off nuclear power and coal with CCS”. Rapid growth in the renewables sector is invoked with the simultaneous assumption that development of any other technology is on hold. This is clear confirmation bias. Overall growth in the quantity of energy demanded is sending emissions skyward even as these mind-boggling growth rates in renewables occur. It’s a simple as looking at the data. The pretence that the author has been careful and rational in his consideration of the role of nuclear is dangerous. Some readers will believe he put some effort into considering the sensible place for nuclear power in a world that needs to tackle climate change. He didn’t. It is a perfect illustration of the point I recently made with co-authors at The Conversation: if we fail in the next 25 years as we have in the previous, it will be so-called environmentalists who are as much to blame as anyone. Next Entry Zero Carbon Options: Report Launch Videos! With PV we’ve seen feed-in tariffs go from 44c/kwh to 8c. Some Germans want their f-i-t burden eased or shared more evenly. In Australia big players like Origin Energy say the RET is not justified. With primes sites used up (obviously true for hydro) we now see wind going to places with high transmission cost. South Australia will be a litmus test for high wind penetration if they build another 600 MW on top of 1200 MW of wind capacity. SA primarily needs to replace gas. If we get serious about replacing coal within a decade I’d expect the build rate for modular Gen 3 and perhaps some Gen 4 nuclear to pick up, Wind and solar may have had their 15 minutes of fame and now the the glamour is fading. “All this means that, unlike the past forty years, it doesn’t matter if clean energy is expensive anymore. In many cases its not anyway, and it will all get cheaper from here on, but that is now irrelevant. When you accept what we face, price no longer matters”. I was going to work this into the blog post, but I was getting fatigued and just couldn’t be bothered. But Gilding seems to be deluded enough to believe that everyone in the world sees the situation through his eyes and values such that price is “irrelevant”. Never mind that the plunging emissions in the USA right now are all about the plunging price of gas, and nothing to do with climate policy. I’ll stop there, it’s too irritating for words. Actually I think the US gas price (natural gas not gasoline) is slowly increasing so the fracking boom may be short lived. There are objections to converting the former LNG import terminal in Maryland to an export facility. A bit like what Gladstone Qld will do the price of SA’s Cooper Basin gas. Ted Trainer makes the point that a high renewables system could be unaffordable in terms of capital raising. That will be reflected in levelised energy costs. Because the numbers are vague there are no succinct sound grabs like ‘it will cost X times more than nuclear for the same reliability’. I think that line of argument is what the public is waiting for. We had a go at making that clear with Zero Carbon Options. I have just posted the launch videos, let me know what you think. And yes it may be short lived, but it’s a powerful example of what we DO need: a direct substitute for fossil fuels to substantially undercut them in price without the political turmoil of internalising externalities. The pace of response in the US to the new gas situation has been astounding. The Gildings of this world bring out the grumpy (not so) old man in me. How does he find publishers for fact-free opinion? I know what you mean, but it’s not so much counter-factual… from what I can see nothing he is stating as fact is incorrect. It’s just lousy analysis! Re John Newlands’ Point 4, above, the IEA reported recently that the carbon intensity of electricity, world-wide, hasn’t improved significantly in 20 years. All that money has been spent, yet we are still standing on the starting line, in fact we are accellerating backwards, further away from the finishing line. Remember also, that electricity is far less than one half of all energy use globally. The other three quarters are still marching along growth lines with carbon intensity that is, in the main, worsening. Any realist will agree that the lack of measurable progress amounts to complete failure of a couple of decades dominated by strategies based on wind and solar, relentless opposition to nuclear energy and increasing reliance on gas, including tight gas. An new suite of strategies is necessary if global ecological and societal collapses are to be avoided. Remember, this is not about rich countries such as Germany playing with billions of Euros. Their success or otherwise matters not at all from a global perspective. The real challenges lie with fulfilling the wants and needs of the other 7 billion inhabitants of this planet. What are the zero carbon energy options for bankrupt and undeveloped nations? There are none on the table. Gilding’s horse named Renewables has died beneath him, yet he continues to whip it. A strange fellow. To quote Hanrahan, “We’ll all be rooned”. 2. IEA press release: Progress towards clean energy has stalled, IEA says. You know what would be fun and illustrative if a media outlet can be coaxed to try it? In the late 60’s and early ’70s, the major American TV networks sometimes hosted a one hour special entitled “The National Driver’s Test” or “The National Science Test” to field viewers with questions about that topic, sort of like a national I.Q. test. I think Walter Cronkite himself hosted one. It was fun, informative, and often surprised you, and remember this was without any immediate viewer feedback. I would love to see the results of an Australian “National Nuclear Test” to see just where biases and ignorances and awareness of things nuclear lay. Such a means might provide a way to target what specific frets and prejudices too many Australians have about nuclear energy — in fact it might even give their assumptions pause for a spell of rationality. Good luck trying such down under there! Needless to say, his sermon apparently hasn’t changed, and he’s happy to cite Denmark and Germany as contextless renewable energy success stories. I’ll take a wild guess: no one from the eco-modernism community was invited? The number of “Likes” (1.3k) and tweets (141) of Gilding’s sermon is pretty scary. I realise that ABC RN followers are probably largely “green” leaning (not me of course) and believe this stuff as gospel. Robyn Williams runs the Science Show but doesn’t seem to listen to the science – unless it comes from Diesendorf et al.